At Cornerstone Homes, there’s nothing that makes us happier than hearing how much our homeowners love their new homes! Our goal is to provide a maintenance-free, all-fun lifestyle, and we can’t help but smile when we accomplish our mission. 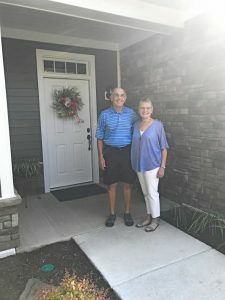 Two Cornerstone couples, Bobbie and Steve Sardelis, and Pat and George Sproveri, have recently moved into the Villas at Ashlake, and shared with us how this decision has enhanced their lives. We wanted to share their stories so you can see how sweet life is in a Cornerstone community! Originally from Richmond, Bobbie and Steve Sardelis lived in Florida for a long time before deciding to move closer to their kids and grandkids. 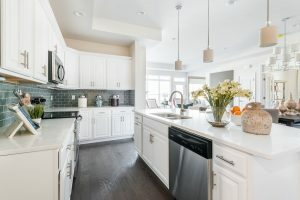 They chose to build a new Cornerstone home in the Villas at Ashlake because they’ve always wanted to have the option to customize their home. In their gorgeous Canterbury floor plan, they customized their fireplace, cabinets, and more, to ensure that their home reflected their style! Between the many activities and clubs at Ashlake, and their new close-knit community, the happy couple is on cloud nine in their new Cornerstone home. Bobbie, who Steve calls “Martha Stewart Junior” for her awesome cooking skills, is enjoying her new gourmet kitchen. She also started the Mahjong group in Ashlake and loves the friendships it has brought her. 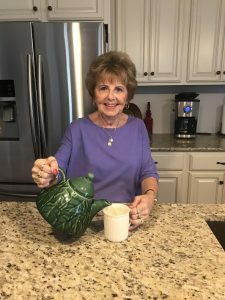 “There are great turn out at events,” Bobbie says, “and we are a small community so it’s easy to meet everyone.” Like Bobbie and Steve, Pat and George Sproveri are loving the maintenance-free lifestyle in their Ducal home. 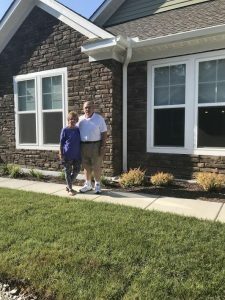 After looking at many 55+ communities, they came to the conclusion that “there is a big difference between NO maintenance and LOW maintenance!” That’s why they decided on a Cornerstone community for their new home — they can do everything they love, and leave all outside maintenance to someone else. 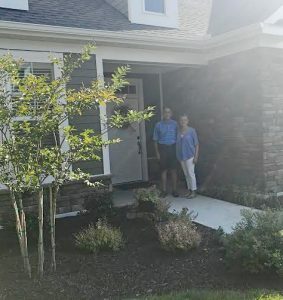 The Sproveri couple stand outside their new home, the Ducal In their single-story home, Pat and George appreciate the generous amount of space and storage they have while also feeling cozy, comfortable, and right at home. The couple is very active in the Villas at Ashlake, and enjoy every opportunity to join in on the fun. George is on the landscape committee, and both love gardening (of course, they’re crazy about the Corner Patch Gardens!) They’re looking forward to jumping into more clubs, including weekly happy hours, coffee socials, the Corner Patch Gardens, and so much more. When it comes to their favorite part, Pat and George say the ability to lock and leave is an absolute blessing — they took their first vacation since moving in and loved how easy it was to pick up and leave. They’re “happy as clams” here! Thank you to our happy homeowners for making our jobs so rewarding. We love that you’re enjoying your time in your Cornerstone home. The best is yet to come!